Swinton Travel is a Manchester minibus hire with driver company that rents out five to sixteen seat minibuses with drivers. You will do well to deal with this Manchester company as its minibuses are of a very high quality and are well maintained and driven by professional and fully qualified drivers. fun night out in any major city such as Liverpool, Leeds, Blackpool and the like. Swinton Travelis also a minibus hire with driver company in Manchester that offers personalised transportation solutions for your exact needs. It is a company that offers reliable and flexible solutions that are different and better than those of its competitors. This company also puts customer safety above everything else and will take extra steps to make your journey a very relaxing and enjoyable one. It also regularly performs safety checks on each minibus to make them compliant with VOSA standards. Besides offering reliable and high quality minibuses with driver for hire, Swinton Travel also keeps its prices very low. That is not all, because it is also a company that can supply wheelchair accessible minibuses on hire. 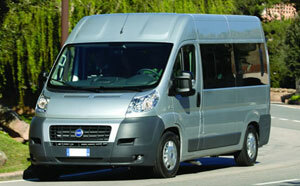 This company allows you to choose from a variety of minibus sizes. For example, you can hire an eight seat minibus such as the Ford Transit Factory Minibus that is driven by fully licensed as well as CRB checked drivers. This minibus will be safety checked every six weeks to VOSA standards and is also professionally valeted to provide maximum comfort. In addition, the minibuses are fitted with radios/CDs and high quality speakers as well as a disabled lift. All these features will help to make your journey a most enjoyable one. This Manchester minibus hire with driver company also supplies the fourteen seat Ford Transit Factory Minibus on rent and for those who need a larger minibus, the company also rents out the sixteen seat Ford Transit Minibus. For those who plan on travelling in a large group, the company offers the sixteen seat executive Ford Transit Factory Minibus on hire. Swinton Travel charges 100 GBP to hire its sixteen seat minibus with driver. For this price, you get to travel by minibus to Manchester Airport. For the same journey, the company charges 90 GBP for its fourteen seat minibus with driver and for 70 GBP it will rent out its 8 seat minibus with driver. To contact this minibus hire with driver Manchester company you can visit their office in person at 397 Manchester Road, Clifton, Swinton, Manchester M27 6NF or you can call 011 959 1649. You can also call on their mobile phone number 07812 345408 and you can also contact the company by email.